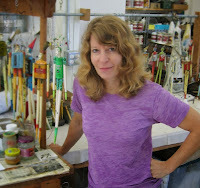 The following is an interview with artist Valerie Bunelle of Florence on her first time participation at Paradise City. Q: How did you learn your craft? How long have you been doing this? A: I have always been interested in clay. I dabbled in high school and unofficially minored in ceramics in college. After school, I worked in several apprenticeships in Vermont and worked on mostly functional pottery. Not until my early-30's did I return to school to earn a BFA from UMass ,and went on to receive an MFA in ceramics at the School of the Art Institute of Chicago in 1990. Since then I've continued using clay in a more sculptural way. The Art Institute influenced me greatly because of its interdisciplinary focus. I had the opportunity to study art history and develop varied technical skills. Along the way, I was exposed to self-taught artists and discovered outsider art. After my formal education, I embarked on a series of hand-built slab constructions that were tower like. I am still inspired by unusual architecture and man-made mechanical constructions. Intrigued by antique dolls and old marionettes that my mother collected, I began making mixed media and ceramic figures. Q: What gives you inspiration? A: So many diverse inspirations. Child-related toys and other items (antique dolls, marionettes, automatons, clowns, board games), to folk traditions (fairy tales, myths, fables, Tarot, medieval costumes), to scientific illustrations, relics,to science (robots, mechanical debris). Very important to me is inspiration from art of numerous countries -- especially Africa. Q: What is your process of creating? How is your craft and/or designs unique? A: I employ slip molds, press molds and hand building in creating my figures. Using form, texture and text, I tell stories through my characters which are made in separate parts and assembled with wire, providing movement and animation. Many of the figures have wings, lending them a sense of potential. They spin, hang, bounce or balance on a pointed stand. A good number of my latest figures are entirely hand-built and highly textured. I have recently begun to collect and incorporate found objects, making each piece one of a kind. All surfaces are stamped, textured and drawn on, then stained and rubbed off in varying degrees before and after firing. This treatment suggests a layered history and gives mystery to the figure which is often made in parts like a 3D puzzle. My work incorporates many ideas and themes which are unique and varied, and as an evolution. The best pieces are arrived at by observing and following up on ideas and directions that occur while I am actually in the process. The difficulty is in making the time to do this kind of slow work in such a fast-paced world and choosing the best ideas to explore.